Pigs have poor eyesight. From when they are little piglets to when they are fully grown it doesn't get any better or easier for them to see. Not because they are overweight per se, but because of genetics. That is why you need to be careful about sticking your fingers anywhere near your pig's mouth, because it may just mistake your fingers for a snack. Pigs are unable to look up at the sky due to the way their eyes are positioned as well as their bone structure, more specifically, their spine. They lack the flexibility to bend their neck in a way where they can position their head upwards. Some people who bring home their pet pig for the first time are surprised that their pig doesn't see well and think there is something wrong with it. That isn't true, pigs just don't see well. 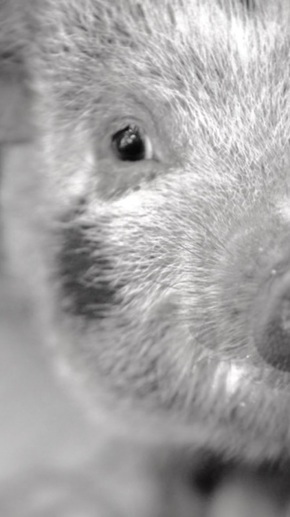 Pigs rely on their keen sense of smell instead. People often complain about drainage from the eyes. How much is normal? What is the discharge and how do you stop it? What can be used to clean it, or does it even need to be cleaned off? 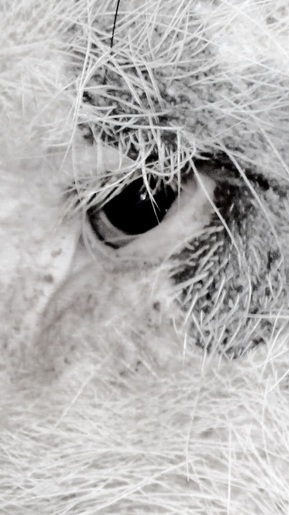 Eye exams on pigs is extremely hard to do for most people, so extensive research regarding the eyes of live pigs hasn't really been done. The blink and fixating refelxes are both dependent on the integrity of the pathways from the retina to the visual cortex. These reflexes are all lost in conditions affecting the cerebrum or in aranilic acid poisoning, which specifically damages the optic nerve tract. 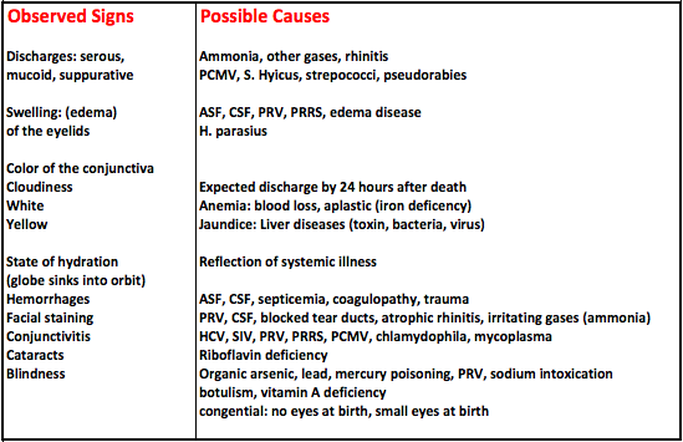 The chart below will show you potential causes for issues you may find regarding a pigs eye. As potbellies age, most of them develop folds of skin which appear to 'cover' their eyes. Except for the severely overweight pig, this is normal. In their older years they may appear to be keeping their eyes shut. Again, this is normal unless it is caused by the pig being overweight. Fat blind is when a pig is excessively overweight and a pocket of fat is covering the eye rendering them blind. Routine cleaning of the ears and the area around the eyes is recommended. A brownish discharge will collect in the hair and eyelashes around the eyes. This is particularly noticeable on white pigs; and, I might add, not very attractive. While quite normal, this discharge should be cleansed away on a regular basis to avoid the skin underneath from getting irritated. Use a warm, damp cloth for these grooming jobs. The brown "gunk" that collects just inside a pig’s ears is kind of waxy and gooey. Q-Tips are not necessary, but should you decide to use them, follow the same precaution that you would with yourself or a child. If only one eye seems to produce copious amounts of discharge, you may want to call your vet and see if there is anything additional they'd like you to do. 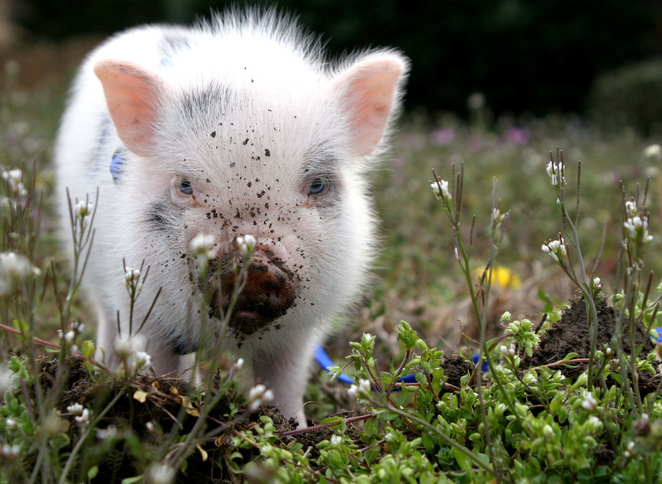 Pigs can easily get a fungal or yeast type infection in eyes that have a lot of buildup. A pet pig generally relishes in all this attention and physical contact from her care giver. Along with a belly rub, it is easy to do a little ear and eye cleaning. Be gentle and don’t use products that will sting or hurt your pig. Take special notice of any thing out of the ordinary. Is there excessive tearing? 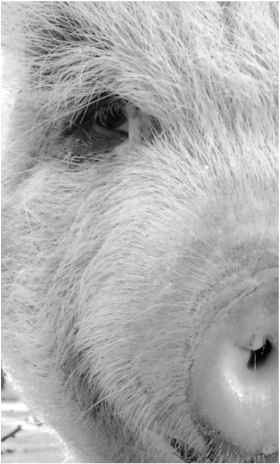 Does your pig tend to squint or blink abnormally? Can you see her eye lashes? Do her lashes appear to be touching her eyeball? Potbellied pigs are prone to various eye maladies including runny eyes, matter build up, entropion, scratched cornea, ulcerated cornea and eye trauma. Work with your vet should any of these conditions exist. Some pigs have markings around their eyes making it appear as if they are "fat blind". Sometimes, this just isn't the case, see the pictures below to look at an example of this. Thankfully, Buttercup doesn't mind (and actually LOVES) her eyes to be cleaned, but she does have the brownish colored drainage some days. I attribute that to digging and debris getting into her eyes. Baby Buttercup-note how easy it is to see her eyes. Buttercup at 3 years old. It is still easy to see her eyes. Same day, another angle. Because of her markings, you can't see her eyes here. Same day, again, it doesn't appear as if you can see her actual eyes. But that is because of her eye markings. Her eyes are actually visible even though she is overweight. There is always the possibility that something got lodged in the eye. Pigs dig in the dirt and fling the dirt with their nose, so the potential for dirt to have gotten into the eye is very likely. Then there is the particles in the air, some hay/straw has dust when its moved and these dust particles can settle in the eye causing irritation. If only one eye is producing drainage, there may be some kind of infection or maybe even a tear duct that has some kind of blockage. If your pig is willing, look at the eye and see if there is any foreign material inside. Some things are microscopic cant be seen by the human eye, but larger pieces of debris can, sometimes you can remove these things yourself, but there are situations when you shouldn't remove or treat yourself as you can cause permanent damage to the cornea. 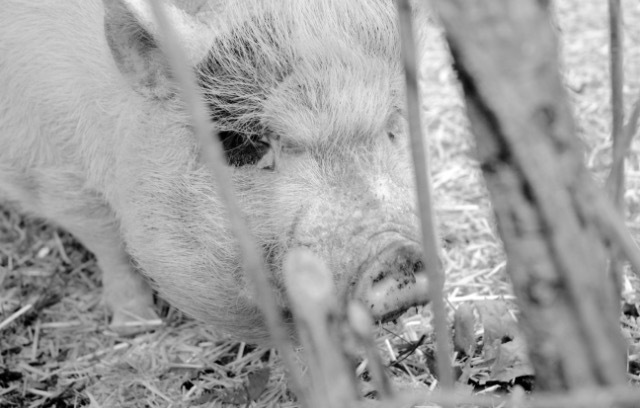 You will have to use your common sense and judgement if your pig has something in its eye causing irritation to determine if you can safely remove the irritant or you need a vet to remove it. Call your vet if your pig has one eye that looks different from the other or is producing more drainage than the other. Vets have a special dye that can be put in the eye and a special light that shows corneal abrasions and/or debris in the eye cavity. Question: "Pig has copious amounts of reddish brown discharge from his eyes. It's sticky and mats up on his eyes and down his face. His skin is also extremely dry and flakes off in big pieces. He's been treated with Ivermectin a couple times but problem continues. He hates being washed so it's hard to keep his face clean and his eyes clear." Answer: Pigs are prone to entropion, a condition where the eyelid rolls inward and the eyelashes are pressed against the eyeball. Pot-bellied pigs tend to have a lot of fatty pads in their faces. When these pigs gain weight, their cheeks and faces puff out. This makes the condition much worse. However, there can be multiple causes for eye discharge. There are times when a foreign object has found its way into the eye area, eye infections, dust from the particles in the air are some other examples of why the eyes may have drainage. Suggestion? Clean them good and see if you can determine what is going on. You can use the eyewash made by Vetercyin (can be bought at tractor supply stores) or even a damp cloth. Eyes can be sensitive, so do not vigorously rub the area as it may begin to sting. Once you have done this in a way that didn't upset your pig, your pig may be more willing to let you do this on a regular basis. I wait until my pig is tired and laying down for the night to do this. She is less likely to protest me wiping her eyes when she's tired. The eyelashes are curling inwards, what do I do? 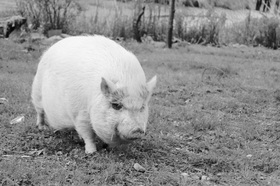 Entropion is an eye disorder that commonly affects potbellied pigs. It is far more common when a pig is overweight, but not all pigs who have this condition are overweight and not all overweight pigs get this eye disorder. There is a surgery that can correct the eyelashes from curling into the eye. Repeated exposure to the eyelashes can cause ulceration to the eyeball and eventually blindness. 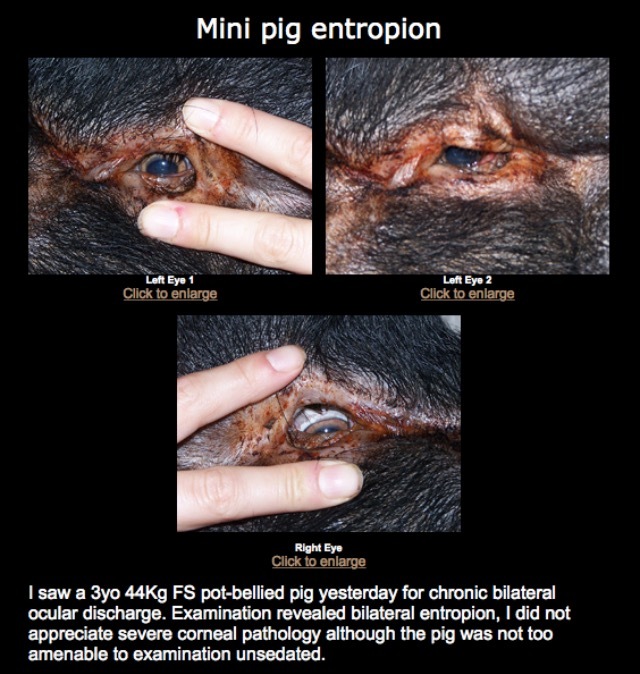 Entropion interferes with eyesight, so your pig is probably both uncomfortable and unable to see well. This makes him jumpy and uneasy about having his eyes touched. Start by working with him during his usual nap time or just after bed time. Sleepy pigs are easier to work with. Tell him you're going to touch him before you do it. Start with a belly rub, and slowly work your hands towards his face. Start with just your fingers, or soft cloth, dry or moistened with plain warm water. Don't try to use room temperature or cold water, pigs generally don't like cold, wet things. When you get your hands up to his face, open his eye and take a look. Very gently, pull the eyelid away from the eye and towards you, just enough to make sure his lashes are out and away from his eyeball. It may take several days of working with him to get to this point, but that's ok. Go slow, take your time, but keep at it. If piggy is on the plump side, loosing weight will help. As the fat pads in the face shrink, there will be less pressure on the eyeball and lash. 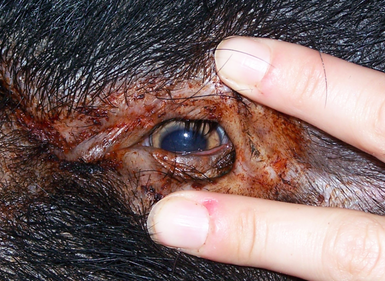 Some vets will elect to do an eye lift and remove the excess fat above the eye after a pig loses the weight. When there are excessive skin folds on the body, that is more opportunity for yeast infections to brew. The constant irritation from the eyelashes can also cause the eye to drain excessively. Entropion can be treated with surgery, but only if the pig is at a healthy weight. If his eyeballs are sunken into fat pads, surgery will be difficult or impossible, and the risk of serious infection is very high, because the incisions will not be able to drain correctly and typically if there is a lot of adipose tissue, the circulation isn't the greatest in those areas, so wounds tend to have a difficult time healing. Again, understand that because of their poor eyesight you should never stick your fingers out quickly toward a pig, especially a strange pig. This could cause you to lose a digit. Pigs have a tendency to snap at things that come at their faces quickly, for understandable reasons. For this reason you should warn children never ever to put their hand out for a pig to sniff. Always move slowly and gently with a pig so that they know what you are doing and where you are. This is a classic example of entropion. As you can see in the picture, the eyelashes have curled in a way so they're inside the lash line and constantly irritating the actual eyeball. For cases like this, weight loss is recommended (this particular pig is overweight) and/or corrective surgery. This pig was also diagnosed with entropion and required surgery to correct it. How do I clean my mini pig's ears? Pigs ears sometimes will get a little wax build-up. This is normal! The ear wax should be chunky, brownish color, thick and may even have a slight smell to it. Still normal. The wax protects your pigs ears from getting debris in them or from flying insects taking up residence inside the ear. Pigs actually usually like their ears to be cleaned in my experience. Instead of Q-tips, which have a point under the cotton head, you can use the ear cups to gently scoop out wax if there is a reason to remove any wax. Brown wax in the ears is normal. This wax can look like mites, but should not be mistaken for ear mites, which pigs can get. DO NOT try to clean deep inside your pigs ear. When the build-up gets bad on my pigs ears I just use my finger nail and scrape it out, being careful not to let any of the gunk fall back into the ear. But, I do not use any type of foreign object or ear cleaner. It is not necessary. That 'stuff' that builds up is their natural defense against dust, particles and tiny insects getting to far into their ears. DO NOT put any liquids in your pigs ear EVER! This can get in their inner ear and cause them to have a head tilt, putting them off balance. If liquid gets into your pigs ears, it can cause serious problems. If you are going to hose your pig down to cool them off during hot days, make sure you do not allow the stream of water near their ears or face. Pigs that get water or debris in their ears typically have the head tilt for a day or so. Click here for more info regarding the mysterious head tilt. ​Most vets tend to want to clean ears when they do other things. With pigs that is not a good idea. We have found and lots of other potbellied pig people that these guys get ear infections and yeast infections when liquids are put into the ear canal for cleaning. We tell people to clean with a damp rag and ONLY as far as your finger will reach in the ear. The gunk thats in there deep keeps water and dirt out. When we clean ears its only as far as the fingertip will go with a damp cloth or cotton ball. That stuff that drives you crazy that is down deep is what keeps the water out of your pig’s ears when he is in his pool, or for outside pigs his mud hole. We found this by trial and error over the years and the pigs that go into vets yearly for checkups and teeth and feet seem to be the ones that are having a problem because people want their ears cleaned while they are there. This is not a dog, it is a pig, who has many means of protecting itself from its environment without our help. Most of the problems I hear from are pigs that have liquids squirted in the ear canal. This can lead to a yeast infection that is hard to clear up. It can also lead to inner ear infections that can cause major problems for the pig and its owner. Both of these problems show symptoms of tilted head and lack of coordination. My vet and I agree that putting any liquid in a pigs ear for cleaning purposes may not be a good thing so we just DO NOT DO IT. You may have to ask your vet to please NOT clean the ears when you take the pig in for his checkups. 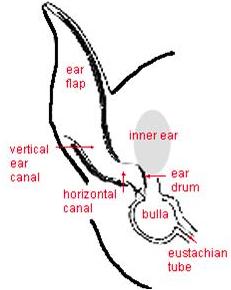 Or you can say NO liquids in the ear itself just a damp cloth as far as the finger will go into the ear. This is caused by a variety of bacteria, but mainly streptococci, that gain access to the middle part of the ear, the part responsible for balance. Infection probably arises from the tonsils at the back of the throat and travels down the eustachian tube to the middle part of the ear. The condition is sporadic but common and in some farms up to 5% of weaner pigs may be affected. It must be recognized early and if treatment is prompt there is usually a good response. If treatment is delayed there is the risk that infection will spread from the middle ear into the inner ear and directly to the brain, setting up a meningitis or encephalitis (inflammation of the brain). Actinobacillus pleuropneumonia has also been identified in outbreaks of the disease and bacteriological examinations should always be carried out if abnormal numbers of pigs are involved. ~The response to treatment in the weaner is usually good using either penicillin/streptomycin or amoxycillin. In acute cases it is necessary to inject the pig twice daily for the first two days and then follow up with long-acting injections. Long acting OTC can also be used. ~Cortisone injections are also of value as advised by your veterinarian. ~Treatment must continue for 7-10 days and complete recovery may take up to 3 weeks. 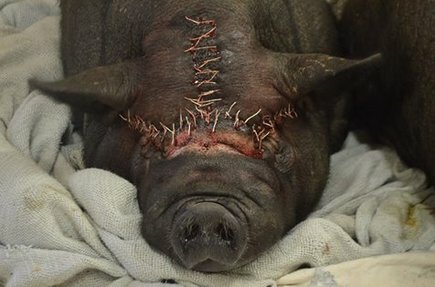 ​Another issue I have seen in recent months is pigs that have always been able to hear and become deaf over a period of time. ​Pigs ears should be upright and erect. If they're not upright and standing tall, and the ears are pointed to the side, this is likely a result of adipose tissue (or fat) forcing the ears in an unnatural position. Being overweight can cause a pig to have hearing trouble or become deaf. Keeping your pigs weight under control can prevent deafness from obesity.